Looking for a few stocks that offer explosive growth potential? Here's why you should check out Tableau Software, TrueCar, and Paycom Software. Our societal dependence on technology has made us increasingly more vulnerable to internet attacks. That's why an ever-increasing number of companies are to looking to internet security companies like FireEye (NASDAQ:FEYE) to help keep them safe. However, while FireEye's revenue has grown rapidly over the last few years, the company's stock hasn't followed suit. Shares have declined more than 56% since FireEye's IPO, which leads some of us Fools to question whether or not this company has what it takes to be a great investment. So which fast-growing companies do we think are better bets than FireEye today? Three Fool contributors picked Tableau Software (NYSE:DATA), TrueCar (NASDAQ:TRUE), and Paycom Software (NYSE:PAYC). 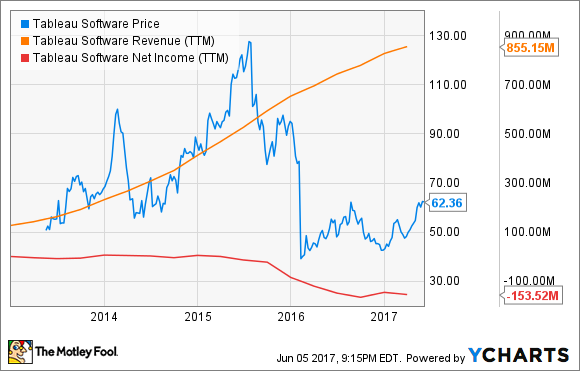 Travis Hoium (Tableau Software): If there's a company that matches FireEye's growth and long-term potential with its short-term losses, it's Tableau Software. The company makes analytic software used by businesses, but has been pounded by the market as it's lost money reconfiguring its business model to create more recurring revenue. Tableau has been adding customers and booking backlog as it transitions to a subscription model, but like most companies that change from one-time sales to subscriptions, the financial impact is negative in the short term. You can see below that while revenue is up, net income has plunged over the last two years. Long-term, the transition to a subscription model is anticipated to lead to higher operating margins and higher profitability. Management said that after breaking even on a non-GAAP basis in 2017, it expects margins to improve beginning in 2018. And as margins improve, Tableau Software will begin to live up to its potential as a company, and the stock could follow as a result. John Rosevear (TrueCar): One time-honored way to build a business is to look for pain points -- things people just hate -- and create a lower-pain alternative. For a lot of people, the process of buying a new car is one of the more painful experiences in their lives. That's where TrueCar comes in. TrueCar works with a huge network of over 11,000 new-car dealers to provide a simplified way for people to buy the new vehicles they want. Shoppers use an easy process on TrueCar's site to select the vehicle they want and find out the average price paid for that same model by others. They can then choose to be connected to local dealers who will give their last, best prices on the vehicle in question, right up front. It's quick and painless and it's free for consumers. TrueCar gets paid by the dealers when purchases are completed. Those payments averaged $324 per purchase in the first quarter of 2017, on about 217,000 purchases. Profit? TrueCar doesn't have any yet. But its losses are narrowing, and it's growing at a nice clip. Revenue in the first quarter grew 22% year over year, to $75.8 million, and its net loss narrowed to $6.8 million from $11.7 million in the first quarter of 2016. CEO Chip Perry, who took TrueCar's helm in late 2015, is planning to generate further growth by adding more tools and information to support consumers throughout the purchase process. According to J.D. Power, almost 60% of people who use the internet to shop for a car stop by TrueCar's site. Perry's plan is to find ways to capture more and more of them over time -- and, he emphasizes, to give them all a great (and painless) experience. While TrueCar's offering might seem easy for a competitor to duplicate, the company actually has a bit of a moat: Under Perry, it has built strong relationships with dealers, while building on the credibility and trust it has with consumers. TrueCar has a solid business today, and a clear path to growth that could drive big returns over time. Brian Feroldi (Paycom Software): While FireEye's stock market performance has been very disappointing, there's little doubt that the company is poised for rapid growth as demand for cybersecurity solutions continues to take off. That makes it challenging to find another company that can match FireEye's long-term revenue growth potential. However, I think Paycom Software could be up to the task. As its name suggests, Paycom specializes in payroll processing solutions, but there's far more to the company than that. While industry leaders like ADP and Paychex primarily focus on payroll, Paycom has built out a suite of products that are used to manage an employee's entire life cycle. This includes nearly every HR function that an employee will come in contact with between hiring and retirement. What's more, all of these functions are managed by Paycom's cloud-based software, which eliminates the need for customers to install and maintain their own servers. When combined, these factors have allowed Paycom to rapidly gobble up market share among small and medium-sized businesses. Currently, Paycom counts more than 18,000 businesses as customers. That's a lot, but it is still tiny when compared to the 28 million small businesses that reside in the U.S. alone. That hints that there is plenty of room left for Paycom to continue to win market share from here. Another attractive trait about Paycom is that the company is already highly profitable. In fact, last quarter Paycom cranked out more than $27 million in profit, which is an impressive achievement given that the company is still so early in its growth cycle. In addition, the company's stock has been a massive home run for investors who got in at the IPO, which is a trait that we Fools love to see in growth investments. All in all, Paycom offers investors a highly profitable business model and plenty of room for future growth. To me, that makes it a much more attractive investment than FireEye.